Since its first summit in Berlin in 2014, the Berlin Process – a regional cooperation initiative bringing together seven key member states and the six Western Balkan countries – has provided a unique contribution to regional cooperation, writes Ardian Hackaj. Ardian Hackaj works for the Cooperation & Development Institute, which recently published a third of a series of reports on the Berlin Process. It is easier to explain the Berlin process by what it is not, and the shorter way is through the “three no rule”: no new financing, no new rules, no new institutions! Berlin Process does not provide new funding for the six countries of the Western Balkans (WB6) infrastructure investments; there are no proper Berlin Process institutions; neither does the initiative has its own rules of functioning. Its transport and energy projects are “borrowed” from the project list of EU Connectivity Agenda, and their financing comes from a mix of sources combining loans, WB6 national budgets, and IPA grants. It is the chair of each Western Balkans Summit that defines the meeting agenda and oversees its organization. There are mostly the development banks, led by EBRD, that define how the investment projects are selected and implemented. 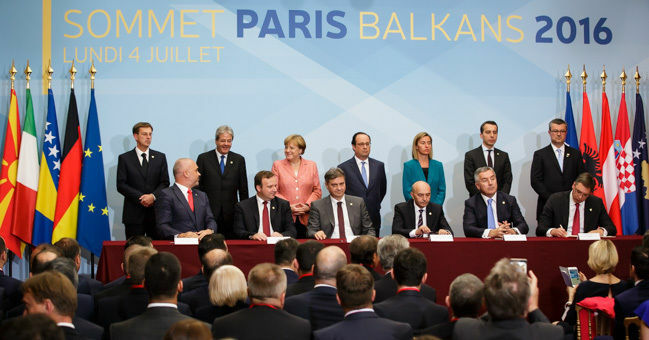 Nevertheless since its first summit in Berlin in 2014, the Berlin Process – a regional cooperation initiative bringing together seven key member states (Austria, France, Germany, Italy, Croatia, Slovenia) and the WB6 (Albania, Bosnia and Herzegovina, Kosovo, Macedonia, Montenegro and Serbia) – has provided a unique contribution to WB6 regional cooperation, to investments in regional connectivity infrastructure, and to the reforms engaged by Balkan countries. EU pundits point out its role in “complementing” the Enlargement, while Western Balkan politicians credit the initiative for “unlocking” the potential of Enlargement. The simple truth is that more than complementing the Enlargement, the Berlin Process de-facto uses its achievements. BP does not focus on Rule of Law or institution building per sè. It uses the achievements of Rule of Law and of good governance to achieve policy outcomes and tangible impact on the ground. In practical terms, the infrastructure projects on new roads and energy, need a functioning Rule of Law and good governance to become reality. The return on investment of this new infrastructure is enhanced or inhibited by the legal context and quality of WB6 government institutions co-responsible for their selection, design, financing and implementation. Their successful implementation is an indicator of the advancement of reforms. The high political profile of this initiative, as witnessed by the presence of key EU member states, has set up the ground for the progress achieved on regional infrastructure and institutional cooperation. On connectivity, the main achievement is the firm placement of the Western Balkans in the transport and energy connectivity map of EU. We have witnessed an increased visibility of Connectivity Agenda as translated in the amount of the available funds supporting the extension of transport and energy networks in the Balkans, the coming in force of Energy Community, the signature of Transport Community, and the debate on rising Chinese involvement in Western Balkans transport network. On regional cooperation, one can mention the increased multi-actor consultation and cooperation, the advancement of a regional perspective in the political fora and in the policy-making, and the WB6 governmental commitment to the engaged reforms. The progress registered on regional cooperation is visible through the outcomes of institution building on the regional level, illustrated by RYCO, the upcoming creation of Western Balkans Research Foundation, and the establishment of Western Balkans Chamber of Commerce Secretariat. On their road to full EU membership, the Berlin Process dynamics is a major contributor of physically linking WB6 through roads and energy systems, as wells as through joint institutions and human relations. Elements of connectivity and of regional cooperation have always been present in the Enlargement strategies. But it is through the Berlin process that both connectivity and regional cooperation moved up in the strategic importance scale, from instruments at the service of Copenhagen Criteria or Thessaloniki agenda goals, to goals per sè. Basically, BP has contributed to the progress in connectivity and regional cooperation to become de facto pre-conditions for the Enlargement. As an outcome-oriented process, the Berlin process focuses the attention of Enlargement actors on the tangible results of reforms and on how they impact the situation on the ground. Its success indicators go beyond normative and institutional achievements, to reflect the situation faced by enterprises or citizen in the Western Balkans. The Berlin process allows for thorough debates based on the performance of WB6 on their way to the EU. Those debates have already contributed to streamlining the Enlargement approach, as illustrated by the Enlargement Strategy (ES) 2018. In the ES 2018, five (out of six) of the ES 2018 flagship initiatives use the arguments and proposals developed under the Berlin Process since 2014 (i.e. increase of funds for WB6 to support growth and convergence, opening of EU programs to WB6, deepening of cooperation in certain key sectors, support to reconciliation and good neighborly relations, etc.). Connectivity has its own flagship initiative, while regional cooperation is pervasive of the whole ES 2018. The Berlin Process brought fresh air in the Enlargement debate by complementing the narrative of negotiations normative and chapter-based methodology, with a much-needed debate on its outcomes on local infrastructure, youth careers, market integration, emigration phenomenon, inequality gap, etc. The visibility to the citizen and impact on the ground becomes the success indicator. Arriving at difficult times in Europe, the Berlin process galvanized the debate about the relationship between EU and WB6. The Enlargement approach and its narrative, built on the lessons learned from former enlargement waves, has been found to be in need of updating so as to respond to the 21st century regional and global context. In this optic, the Berlin Process is contributing to identify and debate common challenges and new opportunities that member states and WB6 countries face together in the XXI century world.